Candidates maintain their own information, keeping their CV up-to-date in a searchable resume database that you configure and control. Employers can browse resumes by category, or they can use WPJB’s built-in search engine that allows users to search resumes by keyword, location, category, experience, and education. With powerful advanced search form Employers can easily filter resumes to find a perfect candidate. The search fields for this form you can customize at any time from wp-admin panel using simple drag and drop editor. 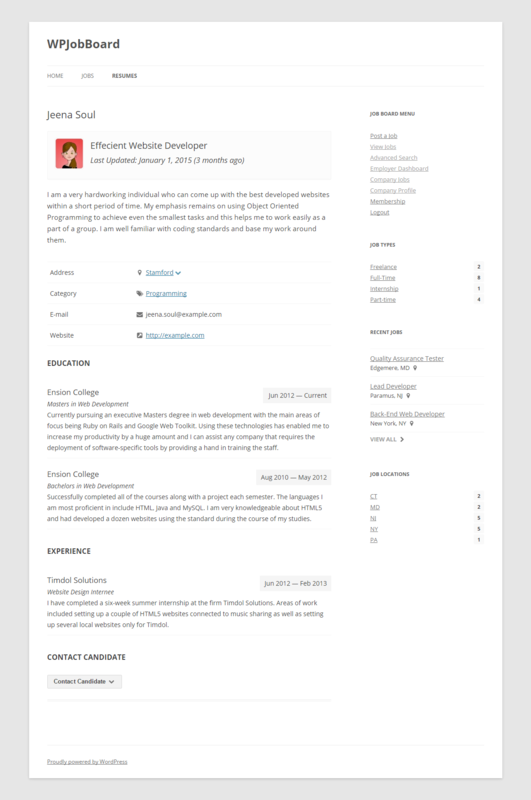 The Resume Form is extremely easy to use and allows to generate beautiful user resumes, if you will ever feel like some field in Resume Form is missing, just add it using Custom Fields editor. At any time registered Candidate can access his dashboard in order to update his resume, view submitted applications, edit job bookmarks and manage his account. 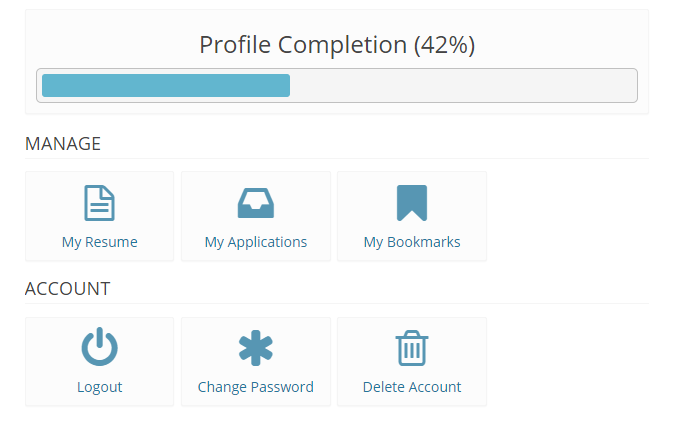 At the top of the dashboard user can see progress bar, encouraging him to fill the whole resume. After registering with your site a job seeker can create a resume for himself/herself using the My Resume form. 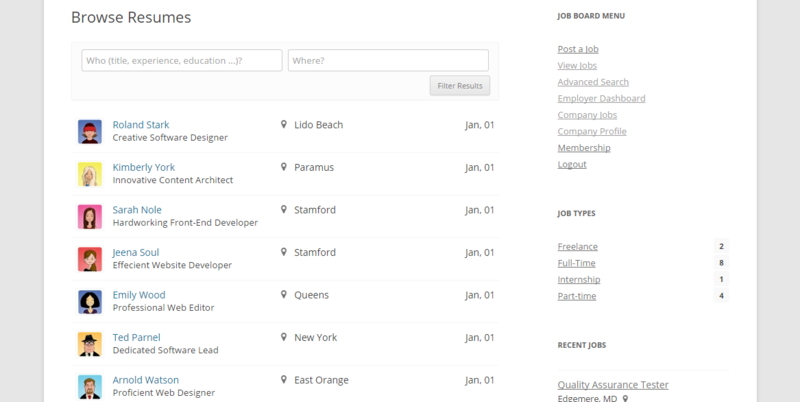 Using this feature, employers can easier find ideal candidates for their open positions. Access to these resumes can either be given to every website visitor, or limited to registered employers or premium employers. 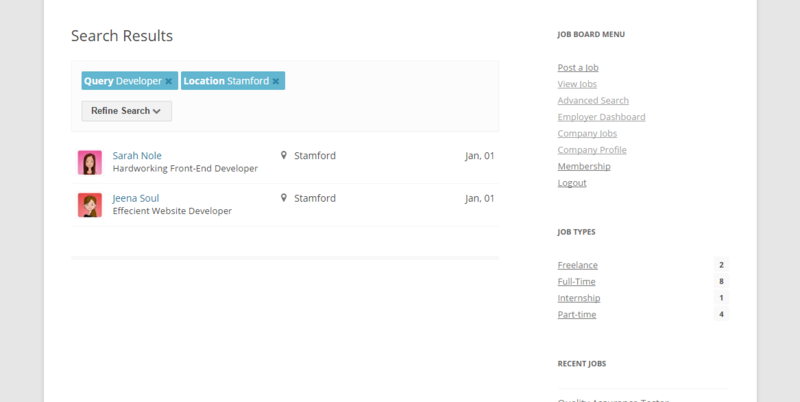 For an extra monetization boost, WPJB even allows you to charge companies for access to full resume details. The entire process is automated for you — payments are made via PayPal. Post-payment employers are given access to resumes for a customizable number of days. Hands free money making!